Equites Property Fund Limited today announced growth of 11.7% in its distribution per share for the six months ended 31 August 2018 to 68.12 cents, as well as a 49% growth in the fair value of its property portfolio over the corresponding period in August 2017, from R6.8 billion to R10.1 billion. Equites remains the only property fund listed on the JSE that offers shareholders pure exposure to modern logistics assets, combined with a proven in-house development expertise. Prime logistics has outperformed retail and commercial property, with strong demand being driven by the growth in e-commerce and retailers increasing efficiencies through sophisticated distribution networks. Equites’ focus on high quality logistics assets, let to A-Grade tenants on long-dated leases and in key logistics nodes, has established the group as a market leader in the logistics property space. The group increased its portfolio value from R1.0 billion to R10.1 billion in the four years since listing. Equites’ track-record of double-digit distribution growth, as well as strong net asset value growth continues to be acknowledged by investors, again awarding it the position of top performing Real Estate Investment Trust over the past three years, with an annualised total return of 24.8% per year. Inaugural issuer national scale credit ratings obtained of A(ZA) (long-term) and A1(ZA)(short term). a successful R800 million capital raise, lower financial leverage and a decrease of the group’s cost of debt. Equites CEO, Andrea Taverna-Turisan, commented that “the group’s resilient performance reflects the quality of assets in its portfolio, which is reinforced by Equites’ ability to unlock key logistical nodes through the development of top-grade logistics buildings. Its unrelenting pursuit of strong property fundamentals has resulted in a tenant profile of almost 93% blue chip companies, a long lease profile which further increased to 8.3 years and a strong contractual weighted average lease escalation profile of 7.9%, which supported robust like-for-like income growth. Continuous operational focus reduced vacancies across the portfolio to 0.2% and administrative costs were maintained at well-below sector averages. The group has successfully renewed 91% by GLA of industrial leases expiring in the year to February 2018 and is pleased that this was achieved with a positive average rental reversion of 4.3%. This represents a retention rate of 83% by GLA. The net asset value per share of the group grew to 1 667 cents per share by 31 August 2018. This equates to a growth of 9.5% over the past 12 months and a compounded annual growth of 12.9% since listing on the JSE on 18 June 2014. Acquisition of two properties from Investec Group Holdings Limited with a capital value of R648 million – a 37 834m² distribution centre let to Nestlé South Africa in Longmeadow Business Estate, Gauteng and a 26 857m² distribution centre situated in New Germany, Kwazulu-Natal and let to Pick ‘n Pay Retailers. DHL development – The group acquired 7.96 acres of vacant land for £9.7 million and concluded a development funding agreement for the construction of a 9 325m² last-mile fulfilment centre pre-let to DHL International on a ten-year lease. The distribution centre is expected to be completed in December 2018 and will have a capital value of £29 million on completion. DSV development – Equites acquired 13.26 acres of vacant land for £4.6 million and simultaneously concluded a forward funding agreement for the development of a 28 124m² distribution warehouse to be let to DSV Solutions Limited on a ten-year lease. The property is situated in Peterborough, a proven logistics area, 80 miles north of London. The building was completed on 23 August 2018 and has a capital value of £30 million. New Premier FMCG development - Premier FMCG Proprietary Limited (“Premier”) is an existing tenant of the group and signified a growing requirement for modern logistics space. To satisfy this need, Equites concluded a development lease with Premier, in terms of which Equites developed a 15 216m² modern logistics facility for Premier. Construction commenced in October 2017 and was completed in August 2018, within the agreed-upon time frame. 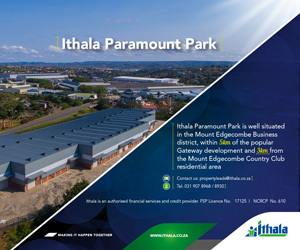 The total capital value of the development on completion is R177 million. This development was constructed on 3.9 hectares of vacant land which Equites owns in Lord’s View Industrial Park in Gauteng. Equites is targeting a 4-Star Custom Industrial As-Built Rating from the Green Building Council of South Africa (“GBCSA”) for this building. This will be only the fourth such achievement in South Africa, according to the GBCSA. Sustainability has been at the core of the design process to ensure a more environmentally conscious building that will operate with a reduced impact on the environment; this includes renewable energy generation through its 2 000 photovoltaic panels, automated energy sub-metering for real time feedback on consumption, water efficient fittings throughout the building and measures to reduce waste which may end up in the council storm water system. The building was designed as a sustainable and long-term beneficial investment for the occupants, the group and the environment. Equites will be looking at rolling out similar projects where feasible. The photovoltaic plant incorporated into this property will provide subsidised clean energy to four of the group’s properties in the precinct – a first for an industrial development in South Africa. Federal Mogul development - Equites concluded a development agreement with Federal Mogul South Africa Proprietary Limited, a global supplier of quality products to the automotive industry, to develop a 10 147m² warehouse with an estimated capital value R95 million. The development lease includes an option to extend the warehouse by a further 5 000m² at the option of the tenant. The warehouse and office will serve as the South African headquarters of the global business. Construction commenced in August 2018 and estimated completion is May 2019. Speculative developments - Equites expects to complete a speculative development at Equites Park, Atlantic Hills by the end of October 2018. The three units will have a combined GLA of 14 956m² and capital value of R152 million on completion. To date, there has been significant interest in the units, and one unit measuring 4 611m² has been let to JF Hillebrand to cater for their growing requirement for modern logistics space. The group has also started a new speculative development in Bellville South, Cape Town, which will house a 6 003m² warehouse on a 10.1-hectare site. The anticipated capital value on completion is R55 million. A speculative development at Lord’s View, with a GLA of 11 275m² and a capital value of R94 million, is expected to be completed by the end of the calendar year. Equites targets a conservative loan-to-value (LTV) of between 25% and 35%, which balances financial gearing with a robust balance sheet. The LTV at period end was 22.1% and Equites has available undrawn facilities of R1.2 billion, which positions the group well to execute on the committed development pipeline. Equites obtained an unsecured credit rating from GCR as the first step in this process to launch a DMTN programme. An inaugural issuer national scale credit rating of A(ZA) and A1(ZA) for the long and short term respectively, is testament to the group’s sound corporate finance and conservative capital management policies. The board is currently evaluating the appropriate timing for the launch of its DMTN programme. Equites has made significant progress in implementing its vision to be a globally relevant REIT, focused exclusively on high quality logistics assets. The group has established itself as a developer of choice in South Africa for logistics facilities that meet the exacting requirements of large users with sophisticated supply chains. It has also successfully established itself as a recognised player in the sector in the UK, having concluded high quality transactions, which will have an estimated value of some £220 million on completion of the current developments.